Zebra longwings (Heliconius charitonius) are one of four longwing and fritillary butterflies found in Florida. 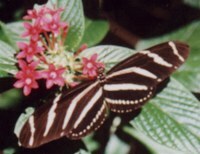 In 1996, Governor Chiles designated the Zebra Longwing as Florida's official state butterfly. The zebra, easily identified by its long black wings striped with yellow, is found in all parts of the state year round. Zebras are especially fond of the nectar of plants of the Verbena family. During the spring and early summer, the zebras in my yard concentrated on the red pentas and occasionally visited the blue porterweed nearby. During the late summer, their attention shifted to the golden dewdrop. In winter, they're attracted to poinsettia flowers. Passion vines host zebra eggs and larvae. Passion vines contain toxins that are consumed by the larvae and make the adult butterflies poisonous to predators. The tiny (1.2mm x 0.7mm) yellow egg is usually laid on new foliage, sometimes in a group. The newly emerging caterpillar is yellow. It will go through four or five instars (moltings), becoming white with six bands of black spots and black branched spines and a greenish-white head that is also spotted and has two spines. When it pupates it forms a chrysalis that looks like a spiny curled, dried leaf. If disturbed, the chrysalis makes a rasping sound. The Zebra Longwing Photo Gallery contains pictures of zebras sipping nectar on a golden dewdrop flower and laying eggs on a passion vine as well as Zebra Longwing caterpillars.